HÀ NỘI — The 19th Asian Physics Olympiad concluded in Hà Nội on Saturday, with the Vietnamese eight-member delegation winning four gold, two silver and two bronze medals. The four gold medals came to Trần Đức Huy from Hà Nội-Amsterdam High School in Hà Nội, Nguyễn Ngọc Long from Lam Sơn High School of central Thanh Hóa Province, Nguyễn Văn Thành Lợi from Quang Trung High School of southern Bình Phước Province, and Trịnh Duy Hiếu from Bắc Giang High School of northern Bắc Giang Province. The rest medalists of Việt Nam are from Hà Nội, Thanh Hóa and northern Quảng Ninh Province. Huy also received the title of the host contestant with the highest results. This year, the organisation board presented 33 gold, 13 silver and 24 bronze medals and nine special prizes to outstanding contestants. Assistant Prof. Hoàng Minh Sơn, Rector of the Hà Nội University of Science and Technology and head of the board, praised the creativity, efforts and determination of the contestants. 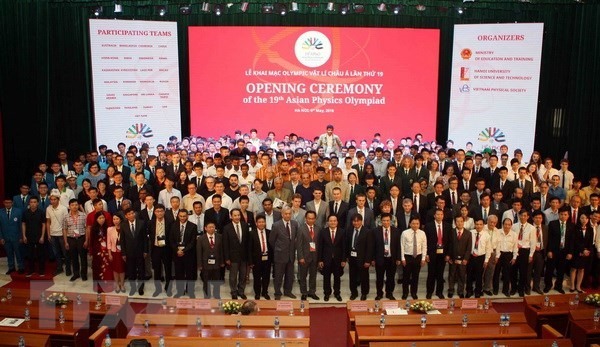 Meanwhile, Leong Chuan Kwek, President of the Asian Physics Olympiad spoke highly of the Vietnamese Government and the Hà Nội University of Science and Technology’s co-ordination and support for organising the event. This year, the nine-day competition drew 188 contestants from 25 countries and territories.